Prestige Fans has added a new range of ceiling fans from the Matthews Fan Company, USA. 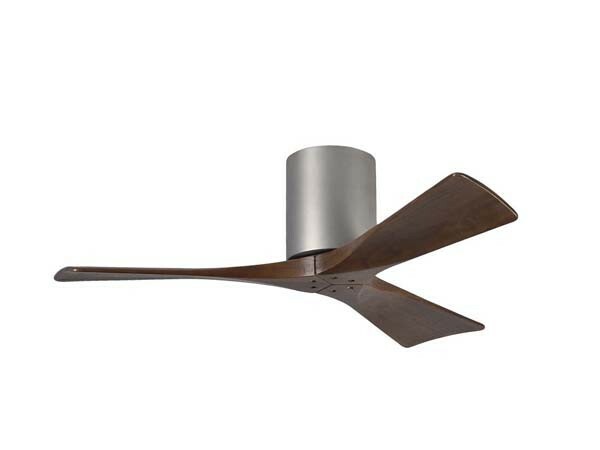 The new Hugger fan from the Atlas Irene range is a ceiling mounted fan featuring a uniquely rustic appearance with its neatly joined solid walnut-stained wooden blades, yet surprisingly modern with a minimal profile. Available with the option of three or five wooden blades, the fan also features a cylindrical motor housing to complement its minimal profile. The streamlined design of the Irene Hugger has a warm and natural vibe. The Irene Hugger range of ceiling fans is perfect for rooms with low ceilings. Low profile fans such as the Irene Hugger are difficult to find. Though many of the fans in the Prestige Fans range can be flush mounted, this usually results in lower airflow/ performance. Rooms with low ceilings, therefore, should have a fan specifically built for close to ceiling installation to ensure the same performance as a regular ceiling fan. Key features of Irene Hugger ceiling fans include choice of three or five solid wood, walnut-stained machine-cut blades in 42", 52" or 60" diameter; energy-efficient, ultra-quiet, six-speed and reversible DC motor with new, reliable technology; ​ damp rated with damp location finishes in either brushed nickel or textured bronze; reverse on handheld, wall mountable six-speed remote control; cast aluminium and heavy stamped steel construction; and limited lifetime warranty​.